Community Crews on the job, a photo by The Bacher Family on Flickr. For the past dozen years, Mount Rainier National Park has hosted Community Crews from the Student Conservation Association each summer. 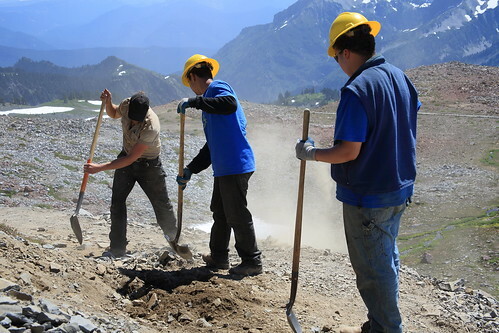 These high school age students spend the school year working on projects in and around their home community, then come out to the National Park for fifteen days during the summer to work on trails, revegetation projects, or other jobs suitable for eight-person teams. Here, Washington Trails Associatoin crew leader John Longsworth works with two crew members on trail maintenance on the Skyline Trail, on a hot, sunny day in mid-August, with Stevens Canyon in the background in one direction and Mount Rainier visible over the shoulder of the ridge in the other direction, behind the camera.